What if a Trucker Just Breaks the Rules? The National Transportation Safety Board (NTSB) often responds to crashes in all modes of transportation with recommendations to regulators to ensure that vehicle operators are not fatigued or impaired. In commercial trucking, for example, we have made many recommendations to prevent fatigued truckers from getting behind the wheel. 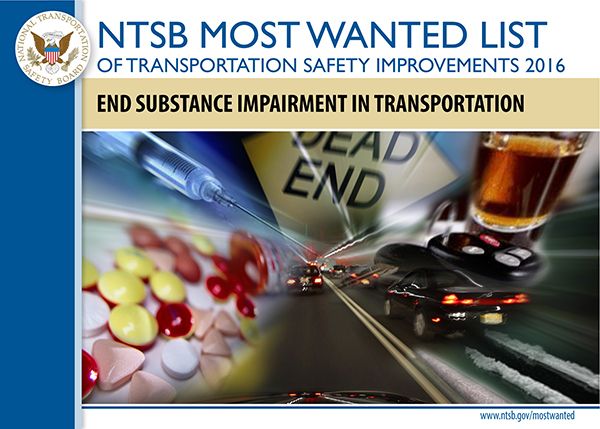 There are also long-established rules about the use of impairing drugs by commercial truck drivers. But what if a trucker just breaks the rules? On October 4, the NTSB met to discuss a tragic crash in Chattanooga, Tennessee, in which a tractor-trailer ran into a line of slow-moving cars at a speed of at least 78 miles per hour. This began a chain-reaction crash that killed six people and injured four others. The driver in this accident chose not to follow the hours-of-service rules and get appropriate rest before he began his trip. He also chose to use methamphetamine before getting behind the wheel. As a result, the driver was impaired by both drugs and fatigue as he approached a clearly visible work zone with slowed and stopped traffic. He deliberately ignored the rules that had been in place to prevent this very tragedy. In such a case, what is there to learn about safety? What can be done to improve safety when a truck driver just decides to break the rules? This question illuminates the value of a safety investigation that does not determine blame or fault, and does not conduct criminal or disciplinary proceedings. Rather, the NTSB’s sole mandate is safety. This means that we not only recommend better rules for truck drivers, but we also continue to look for ways to prevent future tragic crashes, even when a driver simply breaks the rules. One way to prevent another crash like the one in Chattanooga is to keep such dangerous drivers away from commercial trucking. In the Chattanooga crash, we found that the driver’s employer could have used a pre-employment hair drug test to discover the driver’s history of drug use before he was hired. We also found that the state of Kentucky had a list of citations and previous collisions associated with the driver’s 5-year driving record, but his employer had only consulted the driver’s 3-year driving record in the hiring process. In this case, we did make recommendations to the regulator, the Federal Motor Carrier Safety Administration (FMCSA), not to adopt new rules for truck drivers, but to help keep dangerous drivers that break the rules out of commercial trucking. We asked the FMCSA to disseminate information to carriers about hair drug testing. We also asked the FMCSA to specify that an employer must consider any evidence in a driver’s crash record that the driver had violated laws governing motor vehicle operation. We asked that the FMCSA evaluate motor carrier use of and perspectives on their Pre-employment Screening Program, and to collect and publish best practices for pre-employment investigations and inquiries. In addition, we recommended that the states of Kentucky and Idaho include driver status, license expiration, driving restrictions, violations, and crashes in their 3-year driver records. In the case of a tragic crash like the one that happened in Chattanooga, it is for other appropriate authorities to pursue punishment. Our findings and recommendations reflect our mission to improve safety. 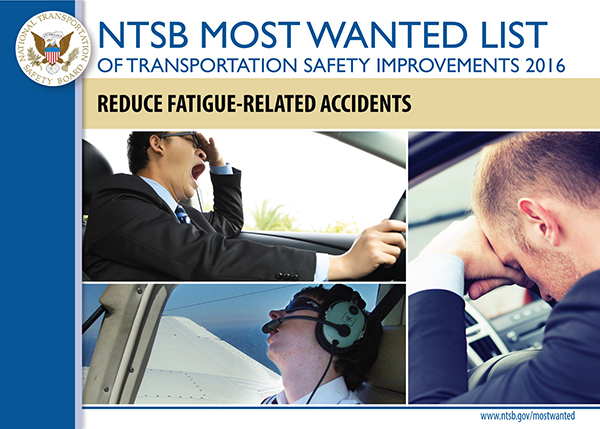 Our Most Wanted List of safety improvements includes ending impairment in transportation and reducing fatigue-related accidents. One way to make progress toward these goals is to ensure that truck drivers with a demonstrable pattern of unsafe behavior are filtered out of the transportation system before their behavior results in tragedy. Americans take an average of four car trips every day—that’s more than 1,400 per year. It’s no wonder that the chance of dying while inside a moving vehicle is about 1 in 6,700. Car crashes are the leading cause of death in teenagers, and second leading cause of death in all other populations. Without a doubt, driving is risky business. Reducing that risk was the focus of the National Transportation Safety Board’s (NTSB’s) Open House and Transportation Education Day held at the agency’s training center in Ashburn, Virginia, on Friday, October 14th. The event brought together local law enforcement, federal officials, safety advocacy groups, and dozens of high school students from Virginia for a day of hands-on learning and activities designed to promote safe driving habits and educate the next generation of drivers about the consequences of making poor decisions while operating a vehicle. The event was a prelude to National Teen Driver Safety Week (Oct 16–22), the annual week-long initiative created by Congress 10 years ago. More than 150 students at the event also took part in real-world distracted driving simulations designed to show just how vulnerable young drivers can be, especially those who are distracted, not wearing a seat belt, fatigued, or impaired in some other way. Teens in attendance had the chance to use a driving simulator to attempt to text and drive at the same time. Law enforcement personnel distributed “impairment goggles” to allow teens to see how different levels of impairment could affect their driving. The teens were also encouraged to spread driving safety messages to their friends. Students were informed that each year, thousands of people die from—and millions more confess to— distracted driving. They were told that, in addition to increased public awareness and tougher laws and enforcement, part of the solution to this problem must be a cultural change—a change that can begin with them. Beyond that, parents also need to be a part of the cultural change. A survey conducted by the National Highway Traffic Safety Administration revealed that only a quarter of all parents have had a serious talk with their kids about the key components of driving. However, teaching children how to drive safely shouldn’t stop when they receive a license or learn how to change a flat tire. Parents should continue to talk to their teenagers about safe driving and remind them of their responsibility on the road. The NTSB is committed to saving lives, but we can’t achieve that goal alone; community effort is required to make a difference. So, take the time to talk to your teenagers about driving safely and responsibly—a luxury parents of car crash victims no longer have. Beat the odds of your teen getting in a crash, as so many do within their first year of driving, and let’s keep our young drivers safe. Please visit our website at http://www.ntsb.gov/safety/mwl/Pages/default.aspx for more information, and join our discussion using hashtag #1goodchoice on Twitter. Nicholas Worrell, is Chief of the NTSB Safety Advocacy Division. My brother is a district sales manager who sells manufacturing supplies to companies across Wisconsin. He spends about 75 percent of his work time in his car, traveling on sales calls throughout the state, often driving 5 hours for a 2-hour sales visit before driving back home. Because he drives a company car, his employer pays for his insurance and gas. When I asked him what types of driving safety training or policies his company has, he told me that the driving safety policy is clear: No texting or hand-held phone use while driving, and always wear seat belts. “But what about drowsy driving?” I asked him. No policies, no training, even though he spends as much time on the road as many interstate truck drivers. Drowsy driving is a serious problem. According to a study conducted by the AAA Foundation for Traffic Safety, one in five fatal crashes involves a drowsy driver. As an accident investigator at the National Transportation Safety Board, I have spent a good part of my career investigating crashes that could have been prevented if drivers made better choices to stay alert, and if employers had proactive strategies to prevent drowsy driving. All of us need sleep, and none of us—even the most experienced drivers—is immune to the consequences of getting behind the wheel while drowsy. In the blink of an eye, your car can drift off the road, risking your life and the lives of those around you. 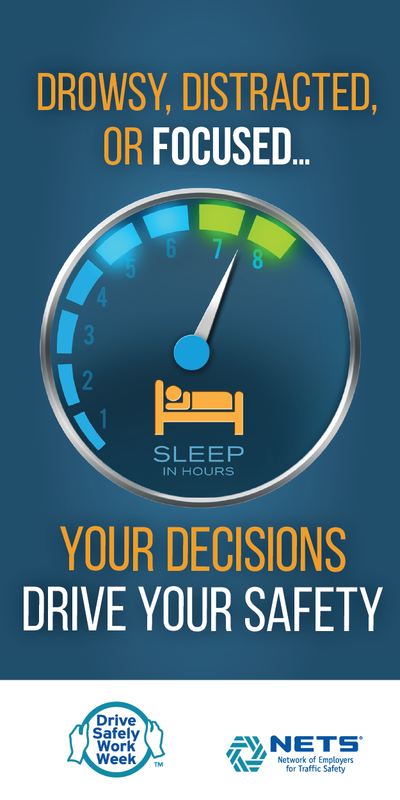 This week is Drive Safely Work Week, sponsored by the Network of Employers for Traffic Safety, and one of this year’s central themes is the importance of sleep to ensure that employees stay healthy and safe. To prevent drowsy driving and increase safety, companies can establish fatigue management programs, which can include setting maximum work times and minimum rest hours to ensure that workers have sufficient time for sleep, educating workers about the importance of sleep for health and safety, providing screening and treatment for sleep disorders, and encouraging drivers to report sleep, fatigue, or workload problems. Even if your company doesn’t have a fatigue management program, there are steps you can take to stay safe and alert while driving. Aim for 8 hours of sleep every night; avoid driving during early morning hours when the brain is wired for sleep; get checked for sleep disorders, especially if you are drowsy during waking hours; and if you feel drowsy while driving, get off the road and stay safe. I am thankful that my brother’s company has paid for hotel rooms the handful of times he felt he was too tired to drive home. But employers and workers can—and must—do more to ensure that drivers are alert and safe for every trip. Jana Price, PhD, is a Senior Human Performance Investigator in the NTSB Office of Highway Safety.